Apple received a lawsuit by a Toronto, Ontario-based man over scratches on an Apple Watch. It’s worth noting that it appears he is the one who made those scratches on the watch in the first place. Apple is sued over scratches on an Apple Watch Series 3 + cellular (42mm), which also appears to be an Edition model equipped with a white ceramic finish. Lubaki bought the device last September, the blog reports. When he bought the watch, Lubaki also bought a 42mm Milanese Loop band as well as the AppleCare+ extended warranty. The way Lubaki explains it is that the Milanese band is the one to blame over scratches on the Apple Watch. According to him, the magnetic rear of the wearable attracts the loop which can cause damage to the device. 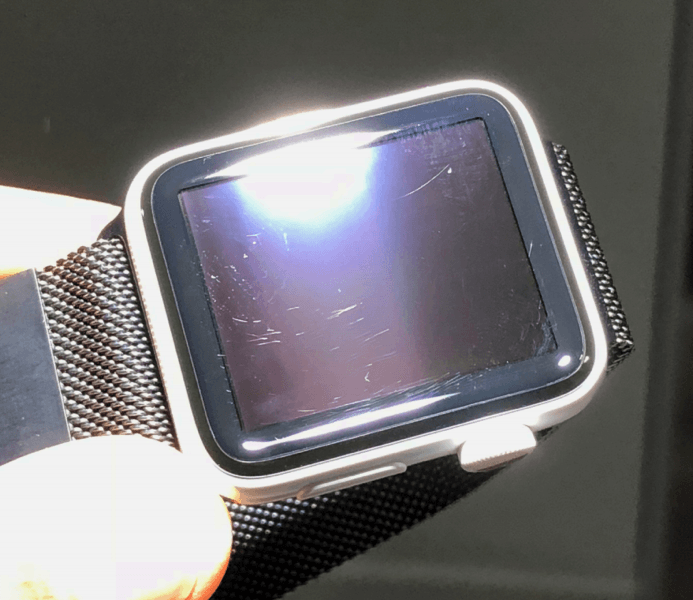 He called this occurrence a “design flaw” in a letter to Apple, adding that the scratches occur when he removes the Milanese Loop band to change straps. “Again, nowhere Apple says that the loop may damage the watch,” Lubaki wrote. Lubaki didn’t immediately file a lawsuit, but initially he went to the Apple Store where he purchased his wearable in order to ask for a replacement, he wrote. After being reportedly denied by the Apple staff who said that the warranty doesn’t apply to cosmetic damages, Lubaki stated that the company’s marketing strategy advertised the wearable as scratch and tarnish-resistant, after which a manager repeated what the staff already told him. Lubaki didn’t receive a response to the letter he sent to Apple, which resulted in Lubaki suing Apple over scratches on an Apple watch. His demands include a refund for the cost of his Apple wearable and the AppleCare+ warranty, as well as punitive and compensatory damages. He also contends that it’s for “mental stress, and expenses that occurred because of the case in addition to the time of my life wasted that I will never get back,” was also his claim. Lubaki added that his Apple Watch issue affected him during the time of his finals at school which “put an additional strain” on him. Lubaki said that Apple “should not get away” with lying to customers, given the false advertisement of the company’s products. iPhone in Canada reports that Apple contacted Lubaki and offered a replacement for his Apple Watch Edition. The company also offered a free accessory. However, Lubaki declined it and he plans to go forward with his small-claims lawsuit. How do you think the lawsuit will end? Is scratch-resistant automatically equal to scratch-proof? Let us know!